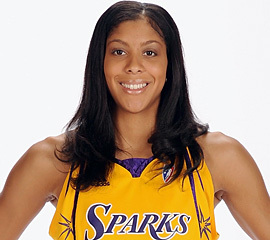 Yesterday Candace Parker of the LA Sparks became just the second player in WNBA history to dunk in a game. (Lisa Leslie was the first WNBA player to dunk in a game.) Parker accomplished her feat late in the second half of the Sparks victory over the Indiana Fever. The six foot four inch Parker is best known as the first woman to dunk in an NCAA tournament game and the first woman to dunk twice in her college career. She is the sister of NBA player Anthony Parker of the Toronto Raptors and is engaged to Shelden Williams of the Sacramento Kings. Parker, who is a former All American at Tennessee and a member of the womens U.S. Olympic team, is the most accomplished female dunker of all time. For whatever that’s worth. Parker once won the dunk contest at the McDonald’s High School All American game. She beat five male competitors including future NBA players Josh Smith and JR Smith (who participated in the NBA slam dunk contest.) Winning the contest put Parker in the company of past winners who include Vince Carter, Carmelo Anthony and LeBron James. Parker won a pair of NCAA championships at Tennessee and was the first player picked in the 2008 WNBA draft.